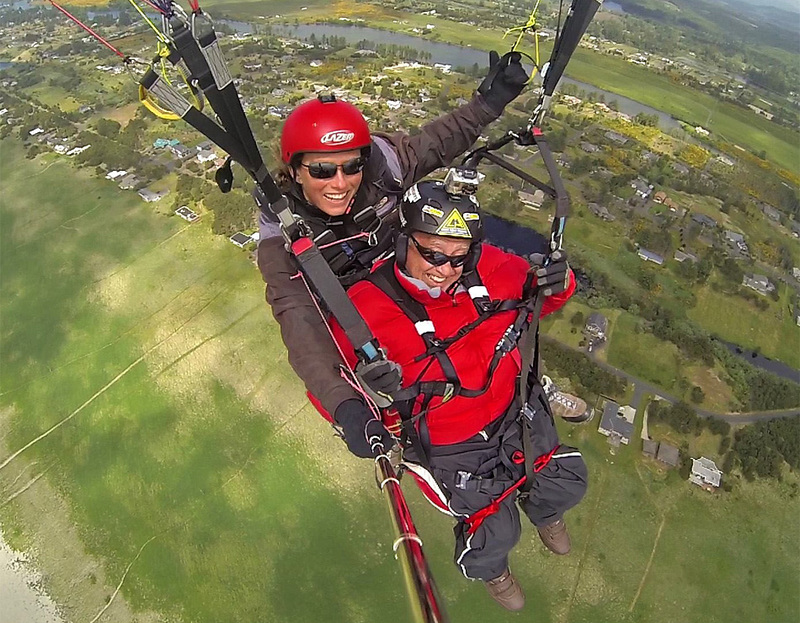 By Maren Ludwig, Discover Paragliding! After a morning trip to the beach had sent us back to the shop for a few hours we eventually headed back out, quite surprised to find decreasing winds. Excitedly, we got our group together and set up for flight. We were all excited because we had a very special tandem on the schedule today. 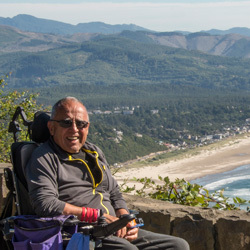 Our passenger, Fred, a former champion extreme athlete, is now suffering from ALS and is confined to a wheelchair. Having the opportunity to share another adventure with him was a genuine honor and a pleasure. It’s hard so say who among us was having the better time! To see it come together made everyone’s day! Fred is looking forward to his next time out as much as we are! After Fred’s flight, we had another enthusiastic passenger anxiously waiting. 3 1/2 year old Jackson, the son of our new student Jacob. He had watched his daddy fly the day before and was anxious to do the same! Only a two tandem day, but one with perhaps our youngest in spirit passengers, and one of our youngest ever (in age) passengers. Thanks to all the folks who helped out to make it all happen! That looks like a fabulous experience. What is next for you Fred? You show no signs of giving in Fred!!! That looks terrific. Fred you a just amazing! Like the Energizer Bunny, you just keep going and doing incredible adventures. Your positive drive is something to admire. Be proud! Soldier on!! Always adventuring, and always smiling, Fred. What an inspiration! Way to go, Fred! You just can’t keep a good guy down (must be the CMH spirit flying high!) :). More flights and working to get back my solo pilots license, All who are interested can join me for a day of flying during the coming months. If a broken down terminal 76 year old can do it so can you. You do it all. What a great example to all of us. Go for it! Live every day to the fullest.